Showing 21 to 28 of 28 posts. Every Wednesday evening throughout the summer. 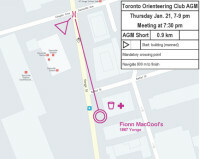 This coming Wednesday eve orienteering is at Glendon College – using a new map. With fantastic weather, 330 kids participated in TOC’s 35th annual Schools Meet at Albion Hills. Check the results. Enter your school in TOC’s Orienteering SCHOOL MEET! Last year we had more than 300 students. Wed Night Orienteering starts this Wednesday (Apr 20) with a FREE event in High Park! Beginner and Advanced Courses. Join us after 6:15. The winter gods smiled just in time at the first “true” O Cup of the season, held at Scanlon Creek Conservation Area near Bradford, Ontario. What I mean is that this awesome, frosty race was the first O Cup with a real dollop of snow and some serious sub-zero temperatures. It was fast, furious, with some ups and downs. 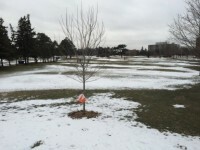 TOC hosted the 4th event in the O-Cup series on Sunday January 24th at Earl Bales Park in north Toronto.